Discover the sights and sounds of colourful Morocco and the dramatic landscapes of the Canary Islands on this tall ship sailing cruise on Star Flyer. Explore the lively souks or historic Kasbah during your time in the exotic city of Tangier, gateway to Africa, before cruising to the historic city of Cadiz with its romantic winding streets. Discover both sides of picturesque Safi, from the tree-lined boulevards of the new town to the atmospheric alleys of the walled medina. Star Flyer cruises to the volcanic Canary Islands and the fascinating city of Arrecife, capital of Lanzarote, then on to Fuertaventura with its stunning coastline. 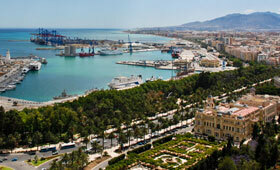 Embark Star Flyer in Malaga. Tangier is a diverse city with a mixture of influences and is the gateway to Africa. The historic medina or old city has charming alleyways and lively souks. Overlooking the medina is the Kasbah which has a museum housing fascinating artefacts, including 16th-century jewellery and a floor mosaic. Just outside the city is the legendary cave of Hercules and picturesque Cap Spartel. Arrecife was once a small fishing village. Today, it is the lively capital of Lanzarote and has pristine beaches, beautiful parks and vast promenades. Perhaps visit Castillo San Gabriel and Castillo San Jose which both house fascinating museums or head to the golden sands of Playa del Reducto. Another noteworthy place is El Charco de San Gines, a beautiful salt-water lagoon overlooked by fishermen’s houses. Fuertaventura is the second-largest island in the Canary archipelago and has a stunning coastline. The island has several traditional windmills and its capital, Puerto del Rosario, is home to characteristic Canarian-style houses and a beautiful promenade. Disembark Star Flyer in Las Palmas. In 2020, this itinerary is 7-nights and omits Puerto del Rosario (Fuertaventura). For navigational reasons the Captain of the ship reserves the right to modify the cruise itinerary. Please note: 13 Nov 2020 departure is 7-nights and omits Puerto del Rosario (Fuertaventura).